An enchanting tropical island, Pulau Tinggi is the perfect place to escape from the busy world. Situated 20 nautical miles Southeast of Mersing at the East-Coast of the South China Sea, the island is renowned for its relaxing atmosphere and sheer physical beauty. 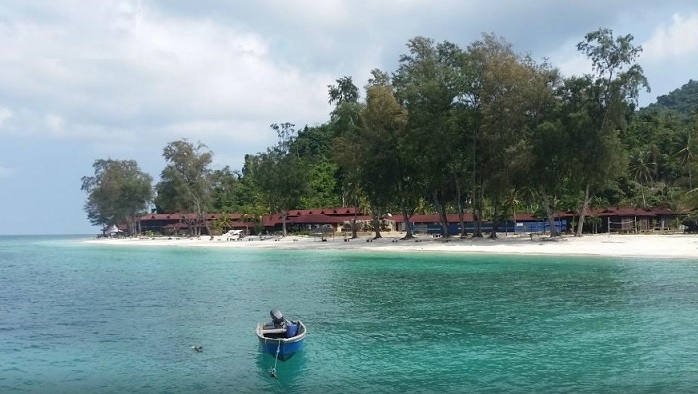 Though it is a secluded and virtually untouched island, it is easily accessible, as a 30-minute speed-boat ride will bring you from the Tanjung Leman Pier to the island. Pulau Tinggi has about 500 inhabitants spread over three villages and is the most populated island of the Johor Marine Park. The three villages are: Kampong Tanjung Balang, Kampong Pasir Panjang and Kampong Sebirah Besar. 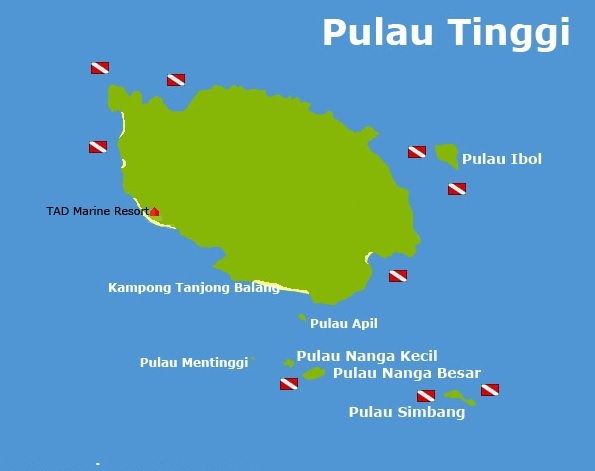 The name Pulau Tinggi literally means "Small Island" (= island Pulau Tinggi = small). Hundreds of years ago, Chinese sailors gave the island another name: "General's Hat Island." Around Pulau Tinggi are still eight small islands, of which two belong to the Marine Park. You are here in the group of islands, of which so often the television programm of "Survival" was recorded, although this concerned then the smaller islands. Around these little island you can still snorkel and dive. The island is forested, and its highest point is 600 meters above sea level. That's the mountain "Gunung Semundu". This is located in the middle of the island. To take a look at the top of the mountain you need to hire a guide in one of the villages. The walk up takes 3 hours, but then you have a wonderful view over Pulau Tinggi and the surrounding islands. The island is like all other islands of the Marine Park surrounded by coral, crystal clear water and sandy beaches. The long coastline, which is dotted with caves, is home to coral reefs teeming with marine life, making it ideal for underwater photography. The longest beach is to the west, which has also the only resort of the island. The interior of the island is largely inaccessible. Only from villages a few narrow paths are running into the interior. Around the island Tinggi is excellent snorkeling and diving. There is also a small museum and a turtle hatchery, where they gather turtle eggs and again turn the born little turtles back into the sea. You can also visit one of the three villages. There's not much fun in the evening on the island. 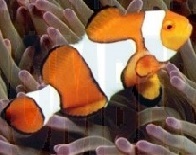 In addition to divers and snorkelers also come peace seekers and those who want to visit an original, unspoilt island. The resort organizes several trips for its guests. The TAd Marine Resort organizes jungle trekking for her guests. 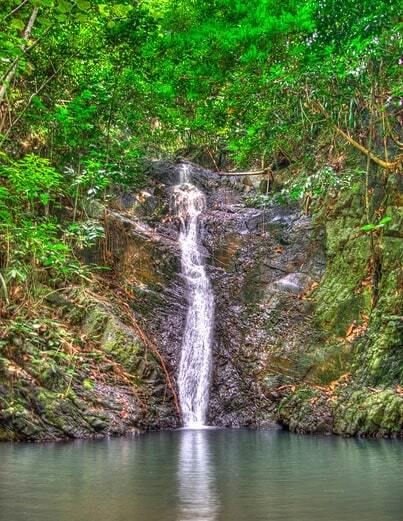 Then you'll follow a path behind the resort to a waterfall with a small lagoon, hidden deep in the rainforest. The trip itself will take you about 30 to 45 minutes, but don't worry, there is a supervisor of the resort with you. Other fun activities organized by the TAd Marine Resort is an excursion to the mangrove forests. In the evenings there are fireflies to admire in the mangrove forests. The hotel also rents kayaks, which allows you to you can sail around the island. You come to Pulau Tinggi Mersing by taking the boat at the jetty. It is not easy. The island is just 40 km south-east. Mersing can be reached by bus from Kuantan, KL and Johor Bahru. 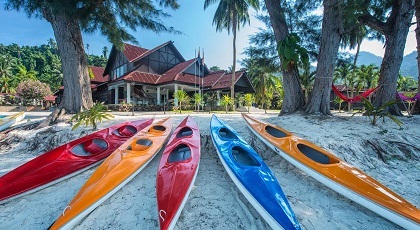 If you want to stay on the island, you should contact the TAD Marine Resort in Pulau Tinggi. The hotel will arrange the trip from Tanjung Leman. The tour lasts just over 45 minutes. Another option is to go with a normal boot of the locals. Contacting with the resort is preferred. Boat Transfer Charges of the hotel: RM 90.00 per person for round trip. Set in Kampong Pasir Panjang, TAd Marine Resort has a garden and a bar. With free WiFi, this 3-star resort offers room service. Guests can sample Asian and local dishes at the in-house restaurant. At the resort, rooms include a balcony. Every room includes air conditioning and a flat-screen TV, and certain units at TAd Marine Resort have a sea view. At the accommodation the rooms are fitted with a private bathroom with a shower. An Asian, halal or vegetarian breakfast can be enjoyed at the property. TAd Marine Resort offers an outdoor pool. Guests at the resort will be able to enjoy activities in and around Kampong Pasir Panjang, like cycling. Mersing is 33 km from TAd Marine Resort. The nearest airport is Senai International Airport, 87 km from the accommodation.